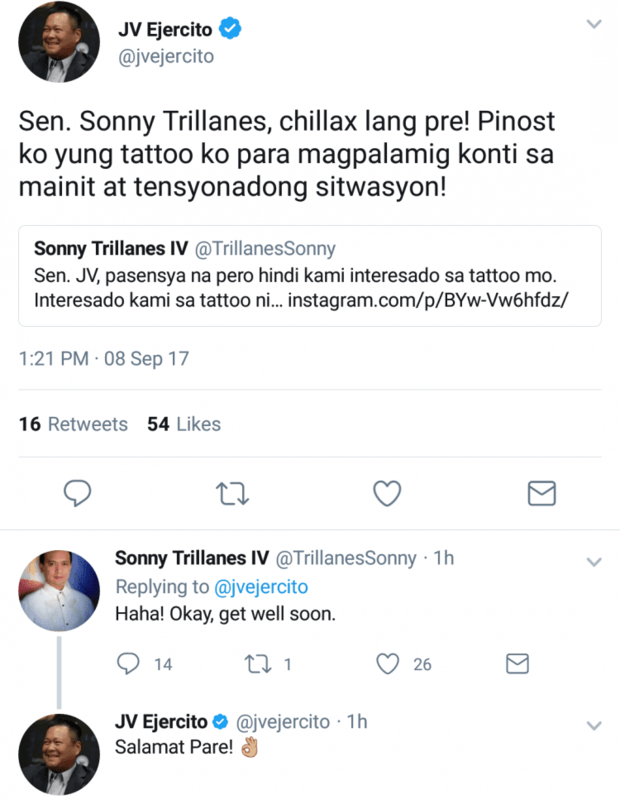 Senator JV Ejercito and Senator Antonio “Sonny” Trillanes IV exchange comments on social media over tattoo issue. Just recently, Davao City Vice Mayor Paolo “Polong” Duterte and Trillanes had a sizzling confrontation in a Senate inquiry over “tara system” at the Bureau of Customs. During the investigation, Trillanes attempt to implicate the presidential son to Chinese drug triad. In the said inquiry, asked the vice mayor to take off his shirt as he claimed that the latter has a colored and a dragon-like figure tattoo at the back. “Yung tattoo mo sa likod, I can imagine, is colored and dragon-like figure, am I correct?,” he said. Meanwhile, JV Ejercito and Trillanes engaged in an exchanged of comments via the image-sharing site, Instagram and microblogging site, Twitter. “Tattoo ang gusto makita ng isa kung kasama, ito sa akin di na aalis! Does this make me a Magdalo? o Pulang Lupa? Hindi po! Magdiwang po ako!” JV Ejercito said in an Instagram post. “Sen. 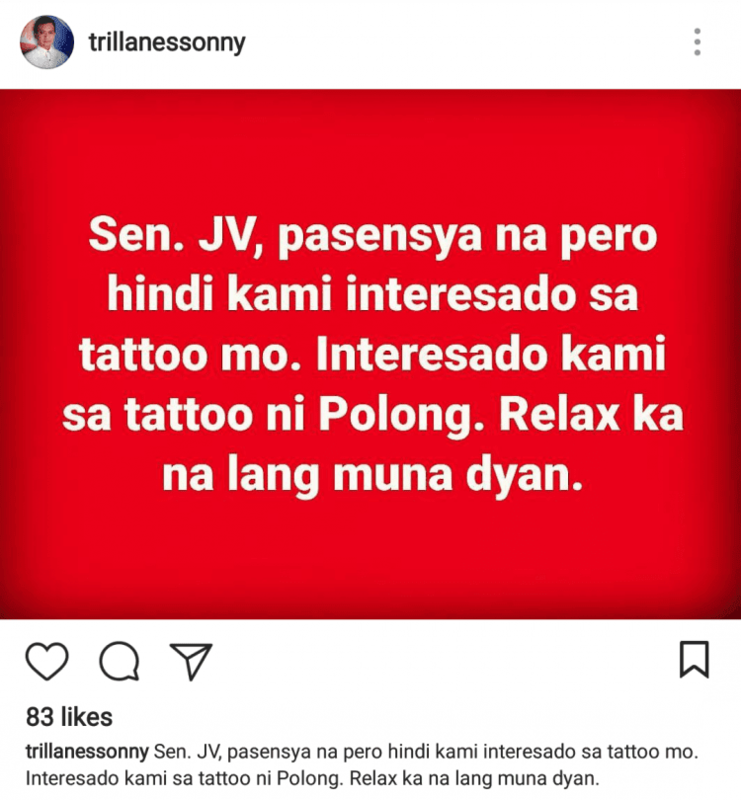 JV, pasensya na pero hindi kami interesado sa tattoo mo. 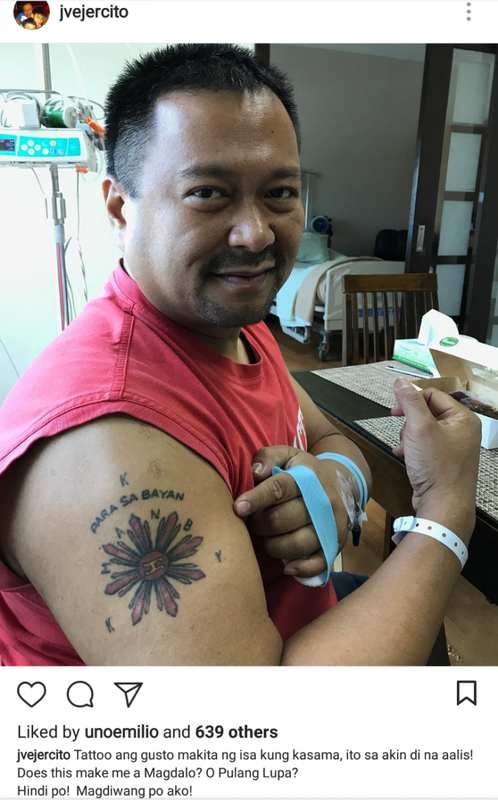 Interesado kami sa tattoo ni Polong. Relax ka na lang muna dyan,” Trillanes commented. “Sen. Sonny Trillanes, chillax lang pre! 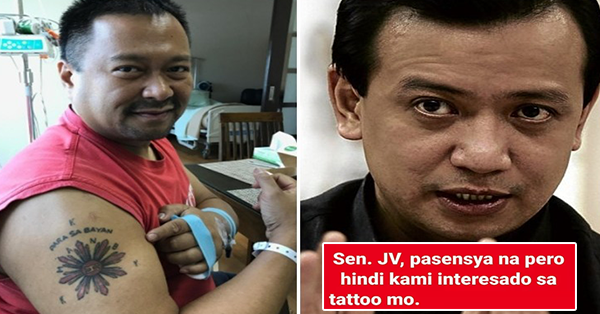 Pinost ko yung tattoo ko para magpalamig konti sa mainit at tensyonadong sitwasyon,” Ejercito explained via Twitter. Concurrently, Paolo Duterte went to Instagram wherein he posted a full piece back tattoo of a dragon-like figure which Trillanes wanted to see. Share us your thoughts by simply leaving on the comment section below. For more news and latest updates, feel free to visit our site often. Thanks for dropping by and reading this post.